The railways' decision to experiment with solar energy to electrify train coaches can substantially reduce its carbon footprint, say researchers. Union railway minister D V SadanandaGowda in June announced a Rs 7-crore pilot project to electrify 30 train coaches with solar power. The solar-powered coaches will start plying within six months on the Delhi-Uttar Pradesh and Delhi-Haryana routes. A team of researchers from Indian Institute of Science in Bengaluru calculate that installing photovoltaic panels atop coaches can reduce 239 tonnes of carbon dioxide emissions per year per train, which is roughly equal to the annual emissions of 50 cars in the city. On an average, 11,000 trains ply in India every day. The researchers say the Railways can save close to Rs 60 lakh annually on each train by shifting to solar panels. 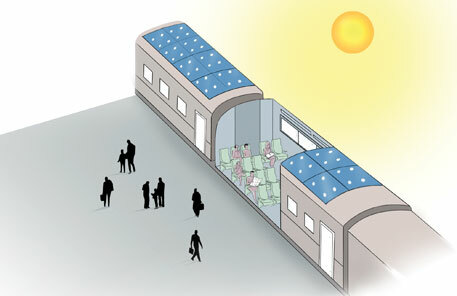 Their paper on the use of solar energy to fuel railway coaches is scheduled to be published in Current Science journal. Lead researcher Sheela K Ramasesha and her team calculated the energy consumption pattern of a train with 19 Linke Hofmann Busch (LHB) coaches, which are used in superfast trains such as Rajdhani, Shatabdi and Durunto. The Railways plan to introduce LHB coaches in all the trains in the coming years. They found that to make a 1,800 km trip, a rake (comprising of 19 LHB coaches) consumes 3,000 litres of diesel for auxiliary energy needs such as lighting and cooling. “Assuming that the rake makes 188 trips in a year, our calculations indicate that 90,804 litres of diesel can be conserved every year, with a saving of Rs 59,93,064, by putting solar panels on the train,” says Ramasesha. The researchers suggest that the estimated price of an LHB rail coach with a solar power generation system is 4 per cent higher than the price of the present LHB coaches. The investment would be recovered within two-three years, they say. Talking about the feasibility of the project, the paper says, “It is clear that the energy that can be harnessed during sunshine hours is much more than the requirements of the train even during the shorter days of winters.” The researchers, as a result, suggest the installation of batteries to store excess energy to be used at night. While the Railways’ move to go green is positive, researchers say introducing solar panels in trains will not be easy. For one, it will be a constructional challenge to install the panels on curved train rooftops. “The solar panels need to be manufactured specially based on the dimensions suitable for mounting. We have submitted a design proposal to officials at the Railway Coach Factory in Kapurthala,” says ShravanthVasisht, one of the researchers. “We are waiting to get a nod from the Railways authorities to test our design,” he adds. Sunil Dayal, a Delhi-based expert on solar power technology, points out another problem. He says the rooftop solar modules will have to survive extreme weather conditions such as rain, dust storms and snow. Besides the obvious wind pressure that will be created during the motion of the train, the panels will be exposed to sand and dust particles, especially in difficult geographical locations. “For example, dust particles in Rajasthan are coarse and they may settle in huge quantities. In that case, the module’s efficiency is lost by three per cent and the panels will require frequent cleaning,” Dayal says. He warns that cleaning the solar modules will be an arduous task. “While cleaning these modules, extra caution has to be taken to avoid eroding the thin film of semiconductors used in them. Though recent advances such as water pump suction system have been made towards maintaining solar panels, they are extremely expensive,” he says. The other major challenge will be storing the surplus energy. Though efforts are being made by numerous groups across the globe, an efficient battery model is still a dream. There are two ways to use the solar energy; one is through a grid system and the other is by using stand-alone photovoltaic power systems. The grid system, without a battery, can supply electricity between sunrise and sunset. “The other option of a stand alone system that uses a battery support to store energy will increase the cost, which might make the project uneconomical,” says Dayal. The problems, though difficult, can be tackled, the researchers believe. They say the Railways can learn a lot from the Shimla-Kalka toy train named Himalayan Queen, which is the first train to successfully use solar power. Each of its coaches is fitted with 100-Watt solar panels, each of which cost Rs 1.25 lakh. The panels generate enough electricity to meet the coaches’ lighting needs for two days. The use of solar panels has also made the coaches lighter by 500 kg and reduced the frequency of maintenance. Of late there is Ã”Ã‡Â£Solar MantraÃ”Ã‡Ã˜ chanted in India. Are not solar panels on the roof of the train meet with air resistence? Thus they require more power from the Engine. Also the present power lines are fitted with out solar panels on the roof of the train. More over when the train is in motion the incidence of solar insulation is not constant and there will be air which will reduce the effect of solar insolation on panels on the roof of the train That is why cars are charged while stationary and energy stored in batteries.I conducted Solar disinfection for safe drinking water and by eliminating the effect of wind there is a gain of about 10 degrees Celsius.How safe will be the solar panels on the top of the train which will be subject to vibration? Its terribly childish to jump with excitement at proposals like solar panels on top of trains. Solar panels we know today are designed for static installation and even with static conditions suffer from terrible fluctuations in its power output due to changing illumination from second to second. The max power point(mppt) controller has a tough time as it is. Imagine the situation when the train travels at 50 kmph, the MPPT will probably go mad! Why Anonymous? Can't you distinguish between stationary top of a railway tunnel and moving train? There are solar panels at many airports and to provide power for Railway signals.Recently I saw at Kuala Lumpur International Airport. Many a time scientists and Technologists lack common sense especially in solving rural problems and this is one classic example. I have a question , can we install solar panels along the Railway lines.Is it possible?